The petro-chemical industry is investing more money and more time into training than ever before. But perhaps some of the most important training is being overlooked by many plant sites and corporate board rooms...dealing with the media during an emergency. In case of an emergency in which the media does show up at your site, here are some suggestions which have worked well in the past. Keep in mind that these are suggestions and all personnel must be adequately trained and prepared in advance. Here are my five tips for dealing with the news media during a crisis. Bring the media inside the gate, just past the security building. This accomplishes a couple of things. First of all, it gets them on your turf where your ground rules apply. In order to stay "inside," they must abide by your rules. Secondly, it prevents neighbors, passersby, or protesters from interfering with your interview. They ultimately will be a part of the story, but you want to be sure your message gets across the way you want it to. Update the media often. If the event is on-going, brief everyone at one time. When the briefing is over, invite them to stay in the designated area and tell them that you will be back in 15 or 20 minutes to give them updated information. When it is safe to do so, provide the media with video tape and photo opportunities. Everyone wants pictures...that is what they need to tell the story. Take media representatives to the designated site together in an organized fashion. Try to avoid "pooled" coverage, which is when one photographer from one organization "shoots" for everyone. This creates animosity at times. If this has to be done, let the photographers decide who will shoot. They should also be responsible for making their own copies. 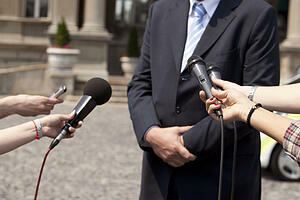 For the electronic media, keep your responses short, concise, and to the point. Remember, your face is only going to appear for about 8 to 12 seconds. You are only part of the story. Editors are looking for something that will "fit" with the story. Don't ever go "off the record." This has come back to haunt many people who thought they were practicing "safe interview" techniques. Responding to the media should only be part of the overall job description of the company spokesperson. In establishing a relationship with the press, that person needs to know the local media managers, publishers, producers, and editors. Some plants keep a newspaper clipping file of local stories written about pertinent topics, especially those relating to their industry or even their plant site. Get a "feel" for who the reporters are and how they write. Also, many plant sites across the nation have what is called "Media Day." This provides an opportunity for plant personnel and the news media to get to know one another. It provides a chance for you to talk to them in a "non-emergency" setting. Will this prevent the media from covering an explosion, strike, or protest at your facility? Absolutely not. But it does establish some level of familiarity or, hopefully, even trust. This comes in mighty handy when things are happening fast. Pro-active planning is the key. By being prepared for the media and getting to know all the players, you can go a long way in making you and your company look good. Professional crisis media management training should not teach how to "survive" interviews...but be structured to show how to be in control and how to take advantage of an opportunity. An opportunity to let everyone know your company cares about the safety and well-being of your employees, your community, and our environment. About the Author: John Voinche’ is a former news reporter, anchor, producer, sales manager and media consultant. Voinche’ also worked in emergency response for 23 years as an officer and Sr. VP of Roco Rescue, Inc., of Baton Rouge, LA. John now owns JV Enterprises LLC, a sales and marketing firm and JV On Message, LLC, through which he consults and trains industrial sites on how to effectively deal with the news media in times of crisis.